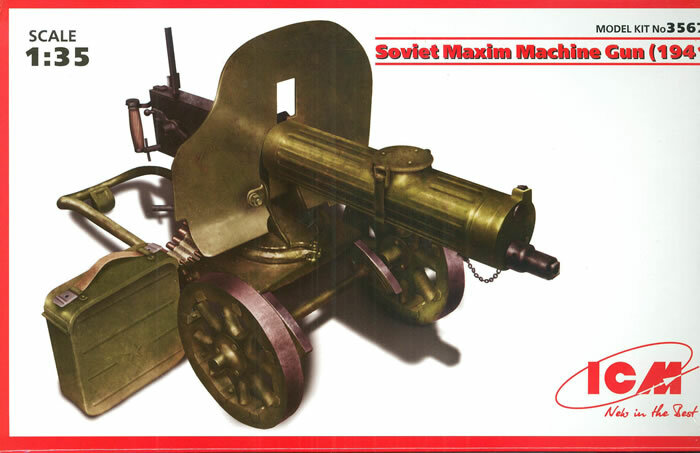 When Sir Hiram Maxim created the world’s first self-loading and firing machine gun in 1885, like Richard Jordan Gatling before him he thought that the weapon would make future wars seem futile and help prevent them. But instead he wound up creating one of the greatest battlefield killing machines of all time and one which changed the entire face of tactical operations in the First World War. While all countries used the basic design of the weapon - blowback operation that ejected spent cartridges, stripped and loaded a new one, and then fired it as long as the trigger was depressed - most adapted the design to their own needs. The Russians began producing one in their chosen 7.62 x 54R cartridge caliber starting in 1910. This was a water-cooled weapon and thus needed a water supply for sustained firing. The gun remained in service for quite some time, and thousands of them served in WWII with some modifications to the basic weapon. This kit follows on the Model 1910 (Kit No. 35674) but replaces the earlier gun with the updated one. Construction is pretty straightforward with the gun itself consisting of seven parts and the remainder providing the unique wheeled carriage and a single ammunition box with belt. No water can or hose is provided for the kit, which for its high price is pretty disappointing. The carriage may be assembled in either towing position with the handle extended (parts A10/11) or folded underneath the gun for stability (A8/13). Finishing is simple - the gun is protective green and the details are in gunmetal. Overall this is a nice single piece but the price is very high for a single small weapon.